Many business owners expect the sale of their business to fund their retirement, with over 30% reliant on it as the primary source. Many are concerned about their level of superannuation following the GFC and the volatile markets of recent years. With so many business owners in weak financial positions looking to sell, and a lack of cashed-up buyers in the market, it’s more important than ever to plan your business exit to extract the highest possible value. Succession Planning is a holistic process to help you align your personal and financial goals with your business performance and value. We help you to identify the current position and value of your business, the price you need for your business sale to meet your personal objectives, and then develop a strategy to help you breach the gap. The process from planning to exit may need five to ten years. Our aim is to have your business adequately prepared, and at peak performance to ensure you get the best return. If you are passing the business on to family members, we help you to put processes in place to make sure the business doesn’t crumble the minute you hang up your keys. Having followed the same pathway in his own life, Don Poole has made Business Succession, Exit Planning, Estate Planning & Aged Care Planning a venture of his. 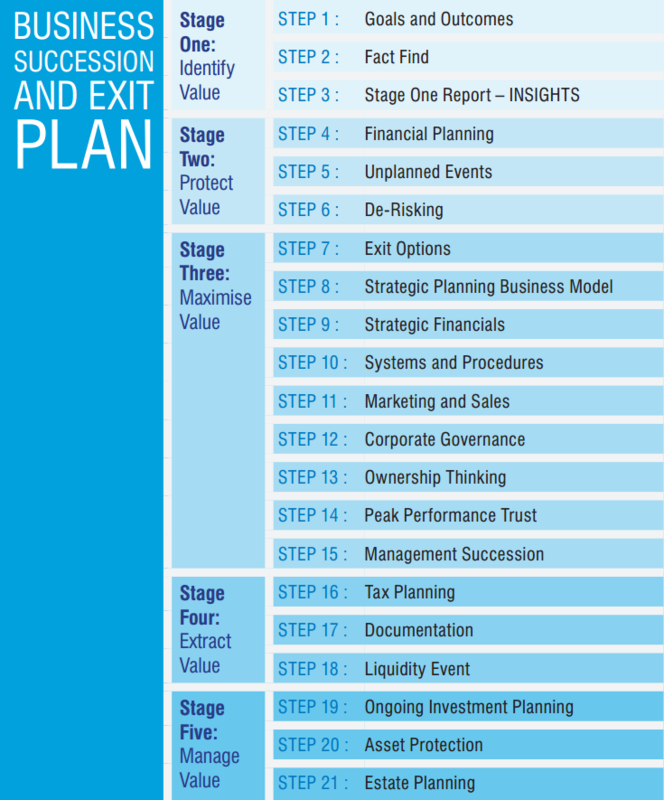 We’ve identified a number of steps that you can take to dramatically improve the performance and preparedness of your business, and hence the value on exit. We take you through those steps over a number of years as you go through the gradual stages of transition. In this past year, I have made Business Succession & Exit Planning a venture of mine. It is one of the most important yet misunderstood financial strategies for any business owner. It relates directly to your ability as a business owner to extract the maximum amount of value from your business when it comes time for you to retire. I want to bring this wealth of information to the table, to help you provide the financial reward you deserve.